This procedure can help restore sun damaged, wrinkled, blemished, acne- scarred skin or blotchy skin to its original youthful radiant appearance. 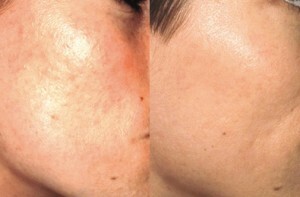 The aims are a smoother, more even-toned textured skin. Dr Harker may suggest other treatments for deeper lines wrinkles and other flaws. Like taking the top layer of skin off an onion, a fresher new layer is revealed underneath. Stripping away the top layer of the epidermis (the top layer of the skin) takes away the dead skin cells and the skin is stimulated to renew itself. Everybody has a busy life these days and people generally do not want to go out of circulation while they recover from a skin peel. 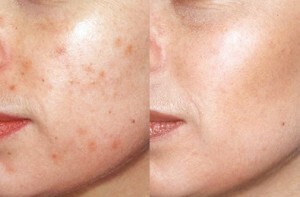 For this reason the peels offered by Dr Harker are superficial or medium- depth only. A tingling sensation or mild discomfort may be experienced, and every effort is made to ensure the patient experience is a pleasant one. This means that usually there is negligible down-time or only a day or two is required afterwards where the patient may not want to attend a social engagement. Each individual’s skin is unique .Dr Harker will take a detailed history and examination to explore how sensitive the patient’s skin is. And the patient’s relevant past medical history. Dr Harker will want to know what the patient is looking to achieve. If the patient is aiming to refresh the skin a milder peel will be chosen. If the patient is looking for rejuvenation a more powerful peel may be suitable. Extreme caution is exercised with first peel, often starting from the mildest. This can be increased in strength as appropriate for the subsequent peels, tailoring the treatment to each patient individually. Over a course of 5 peels, each separated by a week to two weeks there is a noticeable improvement in the skin texture, quality and radiance by the end of the course. Deep peels are now out-moded. Deep peels entail considerable pain and discomfort afterwards and the need to take time off for recovery The deeper the peel, the longer the. down- time afterwards. For these reasons deep peels are not offered at The Erme Clinic. A medium depth Trichloracetic acid (TCA) peel available in two strengths for ageing skin, smoker’s lines, dark spots,wrinkles,sunspots to rejuvenate the skin. Are you a candidate for a peel? A peel can be chosen to suit you if you have slight wrinkles, hyperpigmentation, blotchiness, unevenness, acne, acne scars, black heads or sun-damaged skin. You may not be a candidate if you have oral herpes (cold sores).Preventative treatment with an anti-viral agent such as Zovirax in advance may be advised. Patients are advised on after care and two particular specialised products are prescribed to repair and protect the skin. The skin must be protected from the sun and any other UV exposure and the patient will be advised how long they need to use high factor UV block for depending on the strength of the peel used. Having just made the effort to erase sun damage it doesn’t make any sense to expose the skin again to this injury. Your skin may feel as though it has windburn for a few days with the more powerful peels and the skin feel tight. This is to be expected. The skin should feel normal after 3 to 4 days at the most.